In a perfect world, I would have one large humidor, preferably a walk-in, with all the cigars easily accessible, sorted by name, and labeled with received dates. It would make aging simpler, humidification easier to monitor, and my whole stash more organized. Reality is much different. At any given time I have anywhere from five to seven humidors. The variance is explained by the fact that, depending on inventory, I sometimes outfit two large Tupperware containers with Spanish cedar to store spillover smokes. While I’d love to just have one humidor instead of a handful of medium- to small-sized humidors, the five traditional wooden humidors all carry sentimental value (i.e., the one I got for my wedding that’s engraved with the wedding date), so I just can’t bring myself to consolidate. One challenge with this setup is monitoring the humidification levels of each individual humidor. Each humidor seems to hold humidity differently, and that can make proper maintenance difficult. My solution? Once every so often (more often in the winter, when the natural air humidity is lower) I examine and rotate the cigars in each humidor. I also check to see if the humidification device in each humidor needs to be “recharged.” The whole process can easily take upwards of an hour, sometimes two. Once you’ve arranged the packs inside your humidor(s)—feel free to lay them directly on the cigars—you can essentially forget about the hygrometer (which is likely mis-calibrated anyhow) and only worry about changing out your Boveda packs once they’ve dried up. It’s easy to tell when the packs need to be changed because they feel like dry wafers instead of liquid pillows. When I placed my first Boveda order, I didn’t get enough packs, and most of them dried out after 60 days. In my experience, buying more packs helps drag out the pack life to 90 days. Still, since these packs are $4 apiece, if you need to buy 10 packs every quarter you’re looking at $160 a year just to keep your cigars humidified. That’s a lot of money considering my old method of using distilled water was essentially free, albeit time-consuming. I generally like Boveda, but haven’t quite come to terms with the cost. So I’m open to suggestions on other, more cost-effective ways to maintain proper humidity without wasting a lot of time. I encourage you to offer suggestions in the comments below. I have a (tower shaped) humidor that fits about 100 cigars and I had issues keeping my humidity stable as well. Then I tried acrylic polymer "stick" humidifiers (five of them, one for each shelf in the humidor) and humidity is now at a rock solid 70%. Heartfelt beads for your core humidification. Cheap and uses only distilled water. Supplement with Boveda pillows. Spending an hour with your humidors, rotating the stock, et.al. is like spending quality time with your children. Don't overthink it. Go back to a more cost effective use of your money, i.e. replenish the cigar supply. I'm a Boveda man as well. I'm not aware of another system that will add humidity when needed, and take humidity away when there's too much. I've been burned too many times by sub-optimal humidity to go another route. I think it's worth the money. Patrick, where did you get the chart recommending only 1-2 packets for plastic humidors? 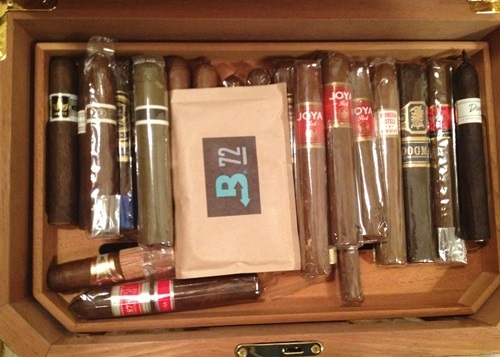 I have used Boveda packets in my Tupperware humidors for years, using 3-4 for the 70 or so cigars in each container. I would be happy to use fewer of them, but they last forever in my Tupperware containers. I can easy go more than 6 months before needing to change them out. They are so much easier to use and take up so little space compared with traditional floral foam pucks, I don't mind the higher cost. I buy them by the case online. The chart is on Boveda's site. I use 1 65% in my Tupperdor, housing 150 sticks, and It holds like a dream for the past few months. Impressive. The company's website did not have that info up when I last looked into them a couple years ago. 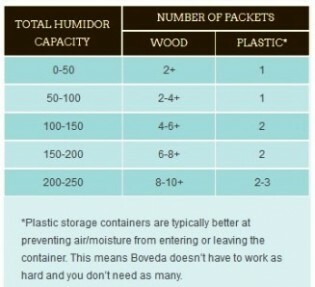 "As a guide, use one Bóveda packet for every 25 cigars the humidor can hold. For example, a 50-count humidor would need two Bóveda packets; a 75-count humidor would need three Bóveda packets, and so on. The only exception to this guideline is for a small 25-count humidor where a minimum of two packets is still needed due to surface area and volume." Maybe I can cut back. Drymistat humidifiers work really well. I have four humidors and I use anywhere from 15-25 drymistats depending upon the season. They are easy to fill and last for months. They cost about $8 each on amazon and basically last forever if filled with distiller water. They are shaped like a cigar so they can fit nicely into various rows of your humidor. I've found it's possible to recharge the Boveda pillows by sealing them in a plastic container with a bowl of distilled water. They won't recharge indefinitely, but I've found they can take 3-4 cycles. Certainly reduces the overall cost, while still getting all the Boveda benefits. I've read you can literally submerge a Boveda pack in distilled water to recharge it. Probably only needs a few days. Over the past few months, since I've switched to Boveda, I've gradually went from using 72% to 65% and I still have a few 85%s lying around from new desktop humidors. I recharge my 65% by placing it in a bag with 2 higher humidity packs (typically of the same %) and the 65% soaks up the 'extra' humidity. BEADS, BEADS, BEADS!! I use Heartfelt and never have any problems. Boveda are nice but spendy. Just started recharging boveda packs in a sealed plastic container with a bowl of distilled water… after about a week they are plump and ready to go again. I don't know if there is a limit to how many times this will work, but obviously the cost is greatly reduced! They do the same thing boveda does, except u do hve to check them every 3-4 days in the winter. But in summer they'll last for about a month or more before yet turn white and need to be recharged. I've had mine for 5 years and they're still working great. I have been using heartfelt industry beads in two desktop humidors for 5 years. They keep everything at 70%. They get two thumbs up from me.